Even before arriving in dealership lots and showrooms, Ford&apos;s all-new 2011 Explorer is already showing clear signs of a success story in the making. Ford has announced that they&apos;ve received 15,000 pre-orders for the crossover, with 3,000 retail orders, 7,500 orders from dealerships, and another 4,500 from companies. This sum actually exceeds pre-sales orders for both the Taurus and Fiesta. Want more? Ford won&apos;t even begin to officially market the new Explorer until January. They are also set to make a good chunk of change due to half of the pre-orders being for the top-range Limited trim, which is set at about $40,000. In addition, two-thirds of customers are choosing 4WD, half are adding a Navigation system, and 87 percent of the orders include Ford&apos;s MyFord Touch infotainment system. 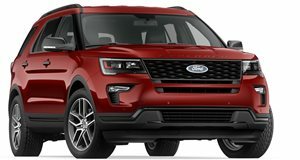 The strong early sales numbers are indicators of the Explorer&apos;s still relevant name recognition as well as a recent resurgence in interest for large SUV/crossover vehicles. There&apos;s been a 25 percent growth for the segment in the third quarter. Bottom line: the launch of the newly reinvented Explorer couldn&apos;t have come at a better time for the automaker.